Enjoy a stay that is within a distance of everything you need on your holiday. On entering the top level you are welcomed with an open plan dining area and modern kitchen, fitted with gas hob, electric oven, fridge and freezer, Nespresso coffee machine (bring your own capsules if you are a serious coffee lover) convection microwave and dishwasher. Part of the open plan area features a large lounge with big comfy lounge suit and occasional chairs, along with gas fireplace. 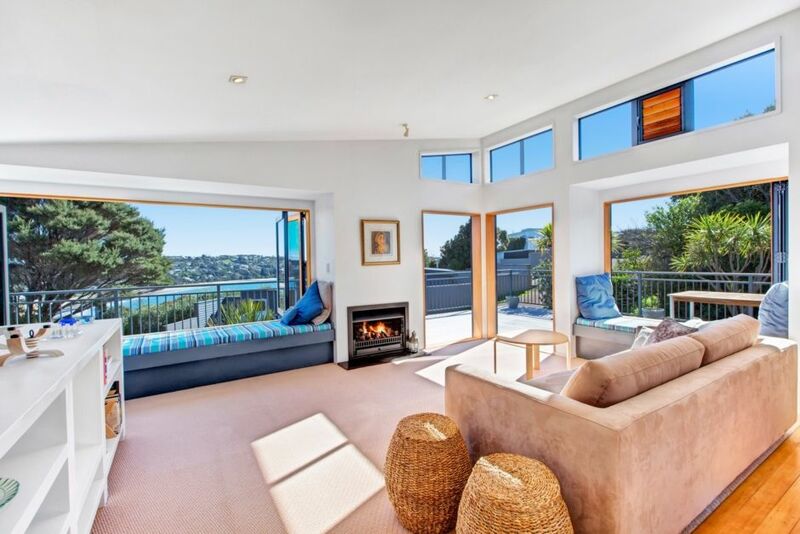 The house has window seats surrounding the lounge room, a great spot to enjoy the views over the beach and beyond. This room then leads out onto a large deck, complete with outdoor furniture and BBQ. There is a small guest toilet on this level for easy access. With the property being elevated it allows guests views over Little Oneroa beach, the perfect place to spend a sunny afternoon or to enjoy a romantic evening under the stars with your loved ones. On the second level you will find 3 comfortable bedrooms, comprising of 2 Queen beds (with electric blankets) and 1 King Split bed (can be made into 2 singles). All beds are brand new and have feather pillows along with standard ones to give you choice of comfort. There are 2 large bathrooms servicing these bedrooms. On the lower level you will find a cosy rumpus room for kids or teenagers to escape to where they can watch TV or play games away from the adults. The property has its own full laundry with a washer and dryer, and is located down a private drive where there is parking for 2 cars/car and boat. Ondine is named after the much loved and enchanting story, The Little Mermaid, by HC Anderson, so come and enjoy and who knows, perhaps the bay is home to other beautiful water spirits like Ondine. We offer outstanding accommodation! Whether it be for your family visit to Waiheke, a corporate off site retreat, or that special wedding accommodation, we have the solution. Waiheke Unlimited, has been in business on Waiheke Island for over 20 years, and our exclusive portfolio are properties which I have personally selected and priced according to what I would be happy to pay. They are located in Oneroa, Palm Beach and Onetangi, and offer the best Waiheke holiday homes within their categories of Luxury Estates, Premium Holiday Houses, Quintessential Kiwi Cottages and our 1, 2 and 3 bedroom Palm Beach Villas. A Waiheke Unlimited Premium property, available for you to enjoy.